Nestlé has entered the UK market following its takeover of Pfizer Nutrition/Wyeth and the SMA formula brand. We are know seeing the aggressive marketing practices it uses in the rest of the world being used in the UK. For example, it is running a series of events targeting health workers to build contact lists and to draw them into defending the company and promoting its interests and products. The events include sessions promoting SMA produts. In some cases, the events are on issues such as vitamin D, iron and colic. Nestlé uses misleading claims on these issues to push its products. In other cases guest speakers will speak on other child care topics to entice health workers to the event. Health workers can obtain independent information on how best to provide nutrients and deal with health problems, together with analysis of company claims, from First Steps Nutrition Trust. For a smartphone version of the boycott list - click here. The campaign led by the International Nestlé Boycott Committee primarily targets Nescafé, the corporation's flagship product. But we would encourage you to boycott all Nestlé products until the company stops promoting its babymilk. 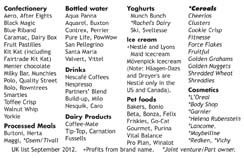 Here is a guide to Nestlé's principal brands in the UK. You will also find brand information on the Nestlé website at http://www.nestle.com/ and on national Nestlé websites. We have set up a discussion group for boycotters with questions about Nestlé's connection to particular brands. To join the group, send an email to nestleboycottproducts-subscribe@yahoogroups.com or click here. Credit-card size cards with the main UK brands on one side and a short explanation of the boycott on the other are available in our online Virtual Shop - click here. We also stock Nescafé - No thanks! and Nespresso - No thanks! cards. Click on the card to order. Items marked with an * are either part-owned by Nestlé, such a L'Oreal, Body Shop, Lactalis Nestlé Chilled Dairy (a 60:40 joint venture between Lactalis and Nestlé, which owns Rachel's Dairy) and Cereal Partners (a 50:50 joint venture with General Mills) or have been sold but there is an arrangement by which Nestlé continues to profit from them. Branston Pickle, Crosse and Blackwell, Fox's Glacier Mints, Gales Honey, Libby's Juices, Sun Pat, Sarsons and Tartex may appear on old lists, but no longer have any link to Nestlé. Findus and Haagen Daz have no link to Nestlé in the UK. Some brand names below link to reports in our Boycott News newsletter giving more explanation. There is a report on own brand cereals manufactured by Nestlé's Cereal Partners business in Boycott News 32. 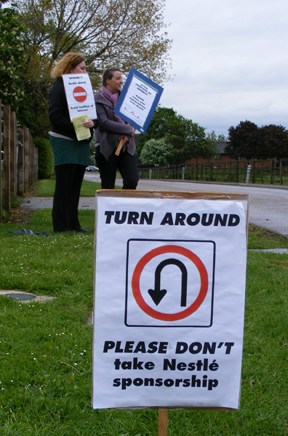 Last change: 7 August 2012: Rachel's Dairy has been added to the boycott list following its move into the Lactalis Nestlé Chilled Dairy (LNCD joint venture). Lactalis purchased Rachel's Dairy in August 2010 and recently announced its move into the joint venture. Lactailis owns 60% of the joint venture and Nestlé 40%. You are currently on our archive site. If you already boycott Nestlé then use the resources on this page to spread the word. If you want to know why there is a boycott and how you can get involved, read the overview below. Update 46 and Boycott News newsletter: Nestlé's Creative Storytelling Venture exposed and other news. 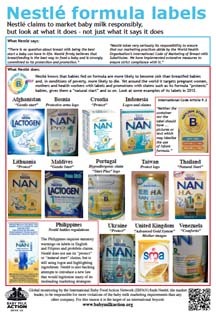 Email Nestlé: Nestlé claims to believe breastfeeding is the best start in life for a child, but promotes its infant formula around the world with claims such as it "protects" babies and is the "natural start" (click on the poster, left, for examples). Nestlé-Free Zone stickers - click here. Nestlé Boycott page on Facebook - click here to become a fan and invite your friends. As well as boycott materials, our online Virtual Shop has resources for health workers and mother-support groups to provide independent and accurate information. 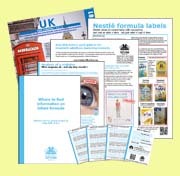 Check out the IBFAN Breastfeeding Calendar 2012 and the Infant Formula Explained DVD. Nestlé is the target of a boycott because it contributes to the unnecessary death and suffering of infants around the world by aggressively marketing baby foods in breach of international marketing standards. Even Nestlé's Public Affairs Manager acknowledges the boycott has widespread support. Although Nestlé does dispute the facts. See our briefing on Nestlé for the current situation, with images, links and references. The boycott will continue until Nestlé accepts and complies with Baby Milk Action's four-point plan for saving infant lives and ultimately ending the boycott. Nestlé is singled out for boycott action as monitoring shows it to be responsible for more violations of the requirements than any other company. The boycott helps to stop some of the specific cases of malpractice we expose and has forced some changes in policy (see some examples here). But Nestlé continues systematic violations in those countries which have not yet brought in independently monitored and enforced legislation implementing the marketing requirements, which is another part of our strategy for protecting infant health and mothers' rights. We have responded to some of the misinformation given out by Nestlé Public Relations Machine in the report Nestlé's Creative Storytelling Initiative - click here. Also see the Your Questions Answered section on our archive site. You can find a list of Nestlé's principal products in the UK by clicking here. It is important to tell Nestlé you are supporting the boycott - even if only for Nestlé-Free Week. You can call Nestlé's customer care line (click here to find out what happens when you do) or send an email via the Nestlé website or through the post. Click here for a suggested letter. You can download the posters from our archive site to promote the boycott in your locality. 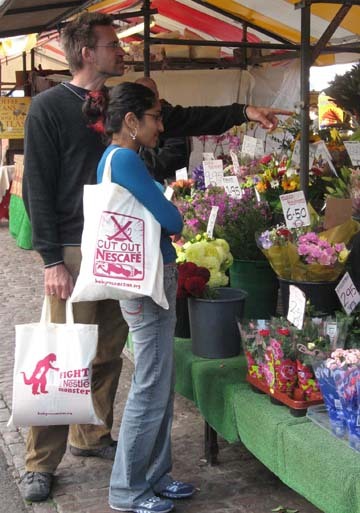 You will also find great merchandise, including our reusable shopping bags (left). Very useful items for your campaigning are the product list cards, giving Nestlé's principal brands. You can collect petition signatures and return these to Baby Milk Action so we can deliver them ot Nestlé - click here for a petition sheet. If you would like to give a talk yourself you might like to download a powerpoint presentation and a short presentation to adapt for your own use (the text has been checked to be legally accurate - please take care if adding information of your own). If you like role playing, you could try doing something like the Nestlé challenge stunt Baby Milk Action did at Nestlé (UK) HQ in May. Click here for details. If you use a service such as blogger, you can go to the 'settings' control panel and add an html page element. Cut and paste the text below into the field for the html and the image will appear with a link to this page! Click here for an example. If you use a service such as blogger, you can go to the 'settings' control panel and add an html page element. Cut and paste the text below into the field for the html and the image will appear with a link to this page! The moving image and Nestlé, Good Grief! jingle given above is available for people to add to their websites and blogs. It will play automatically when the page loads, so it is recommended for a specific page explaining about the boycott or why you support it. Clicking on the image once it has loaded gives several options for what to do next. Use the code below to add it to your site. The widget will evolve over time to include new features and different jingles. You can add a widget like this - follow the instructions. According the the World Health Organisation Authority (WHO) 1.5 million babies die every year as a result of inappropriate feeding. Despite this Nestlé continues to push its baby milks in breach of international standards. Monitoring by groups on the ground around the world shows Nestlé is responsible for more violations than any other company. That's why it is singled out for boycott action. If you don't boycott Nestlé already, I ask that you consider looking at the evidence and giving up Nestlé products, or at least its principal brand, Nescafé coffee. The boycott has forced some changes from the company, but it is still a long way from complying. Campaigners are also working for laws. Nestlé can comply when it is given no choice. It is not being asked to do something that is impossible, but without pressure it continues to put its own profits before infant health and mothers' rights. For further information on what has been achieved since the first boycott was launched 30 years ago, and why the boycott was relaunched and continues today, click here. The boycott is just one part of Baby Milk Action's strategy to hold the baby food industry to account. Find out more by reading our year report. You can help this work further by becoming a member of Baby Milk Action. If you are outside the UK, contact our partners in the International Baby Food Action Network (IBFAN).